Artists Sonia Chow and Huschang Pourian. Canadian graphic designer Sonia Chow and her partner Huschang Pourian were looking for a creative challenge when two guys from Sweden's Icehotel showed up in Hong Kong asking for submissions from enterprising souls eager to design and build 26 art suites of snow and ice, 200 kilometres north of the Arctic Circle. Tied to computer-based, graphic-design jobs in Hong Kong, the duo were eager to bring some physical heft to the 27th-annual quest by the Icehotel's proprietors to give adventure-seekers a chance to explore the untamed northern landscape and hunker down in a palace of ice. "I love that it's like a phoenix rising up from its ashes with new energy every year … and melts back into the river to complete the cycle. No landfill waste. True cradle to [cat's] cradle," says Chow, who has a bachelor's degree in design from the Nova Scotia College of Art & Design. 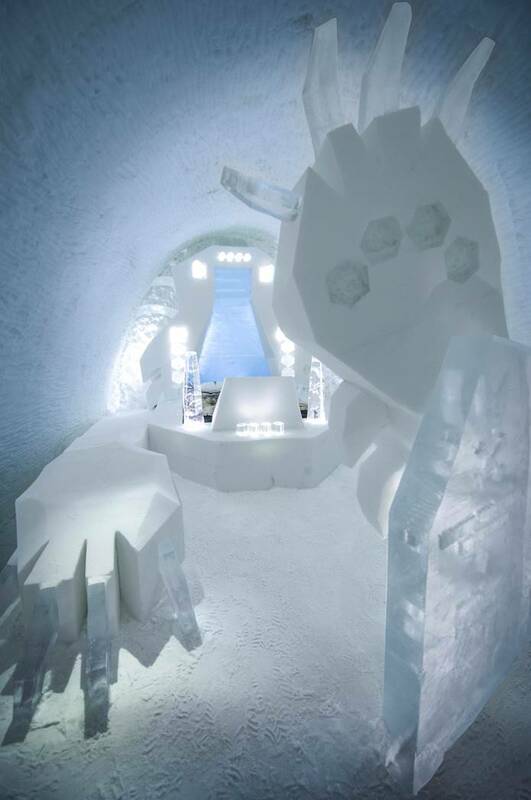 This December, however, marked the opening of Icehotel 365, a 20-room, permanent ice and snow structure (kept cold by a refrigeration plant powered by solar panels in summer) with an ice bar, as well as an ice gallery. Despite the cold, and numb fingers – temperatures ranged from minus-10 to minus-31 – Chow says the experience of being immersed in such a unique project, with artists from around the world, reminded her of the diversity of design. "I was really struck by the interesting mix of concepts playing with spatial perception, fantasy/reality and others focusing more on architectural/abstract/illustrative themes. Art suite Cat’s Cradle or La Petite Mort, designed by Sonia Chow and Huschang Pourian. "With graphic design, the tiniest and most finicky details can all add up to affect the overall outcome. You can continue tweaking until it's perfect. Working with snow and ice, you're not in control of nature and that's okay. You learn to let go of fixed ideas of perfection, to be more flexible, to make quick decisions and to keep sight of the big picture. It also reminded me again how much I love winter and snow!" At the end of the two weeks, Icehotel organized a social evening for all the artists, a special dinner capped with a sauna. Chow remembers that the aurora borealis was sharp that night. "All my senses seemed hyper-sharp, the smell of the birch bark from the wood stove, heating the hot tub we were submerged in, while drinking cold beer and watching the lights dance across the sky. As Icehotel creative director Arne Bergh said to us, 'You arrive as strangers, and become part of the family.'"